A new Chick-Fil-A will open on Tech Road on July 15, bringing the Southern-fried fast-food joint with a cult following to East County. The other week, I sat down with Erik Amick, the store's new owner and operator whose family just moved here six weeks ago. While he came to open a restaurant, Amick's looking forward to getting involved in the community as well. 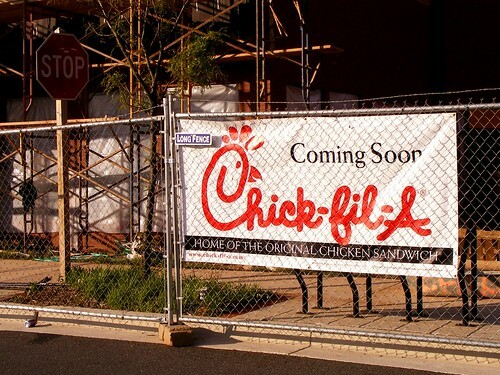 A new Chick-Fil-A will open on Tech Road in Calverton July 15. "I've always had a desire, wherever I am, to make an impact on the people around me," says Amick over banh mi, the Vietnamese stuffed sandwich, at Saigonese Restaurant in Wheaton. Born in Michigan, he grew up in Florida, where he attended Palm Beach Atlantic University. In 1998, fresh out of school and newly married, Amick and his wife traveled across the world, doing a mix of missionary and relief work. The couple spent time in Indonesia, Turkey, and even worked with Malian immigrants in Paris before settling in Atlanta, where they joined the church who sponsored their travels. 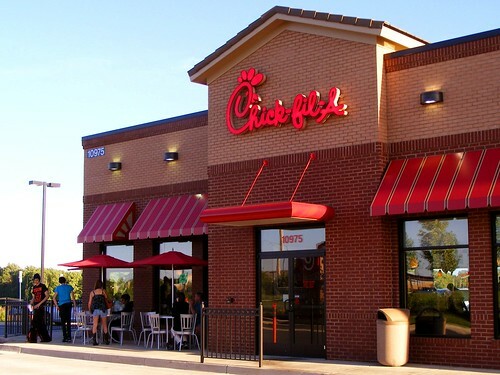 While there, he grew attracted to the mission of Chick-Fil-A - founded by fervent Baptist S. Truett Cathy and well-known for its policy to close on Sundays - and began a grueling, fourteen-month interview process to be selected as a store owner and operator. The company culture "is caring, generous, giving and positive," Amick writes in a later e-mail. "One where people seek to serve each other rather than outdo each other." He quotes the company's corporate purpose: "To glorify God by being a faithful steward of all that is entrusted to us. To have a positive influence on all who come in contact with Chick-fil-A." "My goal is to fulfill this purpose in Silver Spring," says Amick. "I can have a positive impact on not only my employees, but the people who live nearby." When he was finally selected to open a store, Amick asked to be placed "anywhere in the Southeast," though he looked forward to following a brother-in-law who'd recently moved to the D.C. area. His new Chick-Fil-A will be one of the chain's first freestanding store without a drive-through. The chain's branch in downtown Silver Spring also lacks one, but it's located inside a larger building in an area with considerable pedestrian traffic. The new store will be larger than this Chick-Fil-A on Johns Hopkins Road in Howard County, but it'll also have outdoor dining space. "To not have a drive-through is a challenge for us," says Amick. They plan to make up for it by having a larger-than-usual dining room, with 160 seats. 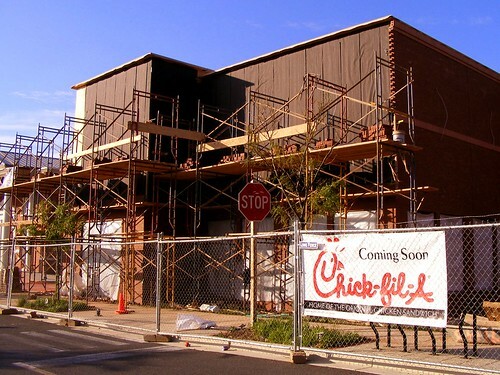 By comparison, the recently-built Chick-Fil-A at Route 29 and Johns Hopkins Road in Howard County has only 100 seats. The new store will also have a "substantial patio," joining other restaurants in that shopping center with outdoor seating. Like many newcomers to East County, Amick's discovered that it's hard to describe exactly where anything is when everything has a Silver Spring address. For example, the corporate office originally called his store Chick-Fil-A at West Tech Village Center. He made a Facebook page for it, but when no one joined, he wondered if the store's name should include Silver Spring, though that would create confusion with the current Chick-Fil-A Silver Spring located on Ellsworth Drive downtown. "Where would you say it is?" he asks me. I live a five-minute drive from the new store, I explain. The census says I live in Calverton, though I have a neighbor who would answer "Briggs Chaney" and another, "Burtonsville." 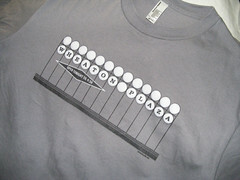 Our post office is called "Colesville," but the Super Fresh nearby advertises itself as being in "White Oak." Generally, I say I live in Silver Spring "at 29 and Cherry Hill Road," and if that doesn't clear it up, I add, "by the Target." Given all of this, Amick later names the Facebook page "Chick-Fil-A at Tech Rd. 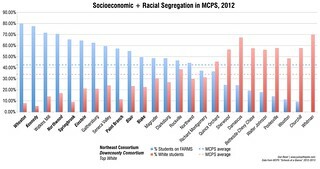 Silver Spring," which seems clear enough. Since moving to Cloverly in March with his wife and three young children, Amick's been reaching out to the community, visiting local churches and exploring Silver Spring and the surrounding area. "I'm grateful to be in a place" with so much diversity, says Amick, whose listed interests on Facebook include "Traveling" and "Cote D'Ivoire." "I'd rather be in another culture than my own," he continues. "Being around people who are different than me and learning about them . . . that energizes me." Not only that, but his family's received a warm welcome. "We went to downtown Silver Spring and brought our [eighteen-month-old] with us to eat dinner," Amick explains, "and were really amazed by how friendly people were, coming up to us on the street and talking to us." "Atlanta's known for Southern hospitality," he says. "I felt like 'Wow, people are more friendly here than they are in Atlanta." I seriously would pay money to watch the person who decided half of Montgomery County should have a "Silver Spring" address be disemboweled by wolves. I despise that person like I despise few people on this Earth. If he wants to reach out to this area which is home to the Seventh Day Adventists' world headquarters, he can start by including vegetarian 'chicken' on the menu the way several local restaurants do (Hunan Manor, Golden China, Kim's Hunan, to name a few). He can get vegetarian chicken wholesale nearby at Potomac Bible and Health Foods next to Target.